The Home Decorators Collection Railey LED 60 in. 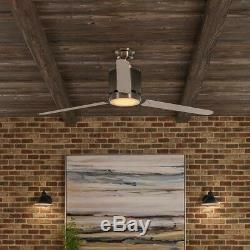 Brushed Nickel ceiling fan has a soft contemporary design. The dome style light kit with frosted opal glass includes a 16-Watt LED light source. The LED light source is both energy efficient with a warm light of 3000K temperature. Also this 3-blade fan will push out 6,870 CFMs if needed. The hand held remote control will control the dimming and speed function. California residents: see Proposition 65 information. Dome style light kit with frosted opal glass. Hand held remote control operates this fan with independent light dimming and speed control, includes battery. Slide on bracket for easy installation to junction box. Decorative canopy ring and coupling cover are used to conceal any exposed screws. How to choose the right ceiling fan for your home. : 60.00 in Assembled Height in. : 14.60 in Assembled Width in. : 60.00 in Ceiling Fan Width in. : 4.5 Fan Blade Length In. : 25.20 Fan Blade Width In. : 60 Features: Integrated LED, Reversible Motor Fixture Color/Finish: Brushed Nickel Glass Style: Frosted Housing Color Family: Nickel Included: Downrod Included, Hardware Included, Light Kit Included, Remote Control Included Indoor/Outdoor: Indoor Light Bulb Type Included: LED Light Type: Integrated Motor Speed (RPM): 178 Mounting Options: Standard Mounting Type: Downrod Mount Number of Blades: 3 Blades Product Weight lb. 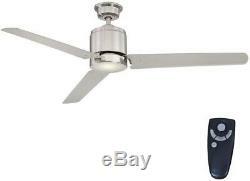 LED Indoor Brushed Nickel Ceiling Fan with Light Kit and Remote Control" is in sale since Friday, March 30, 2018. This item is in the category "Home & Garden\Lamps, Lighting & Ceiling Fans\Ceiling Fans". The seller is "selectway" and is located in Multiple Locations. This item can be shipped to United States, Canada, United Kingdom, Denmark, Romania, Slovakia, Bulgaria, Czech republic, Finland, Hungary, Latvia, Lithuania, Malta, Estonia, Australia, Greece, Portugal, Cyprus, Slovenia, Japan, Sweden, South Korea, Taiwan, South africa, Thailand, Belgium, France, Hong Kong, Ireland, Netherlands, Poland, Spain, Italy, Germany, Austria, Bahamas, Israel, Mexico, New Zealand, Philippines, Singapore, Switzerland, Norway, Saudi arabia, United arab emirates, Qatar, Kuwait, Bahrain, Croatia, Malaysia, Brazil, Chile, Colombia, Costa rica, Dominican republic, Panama, Viet nam, Uruguay, China, Antigua and barbuda, Aruba, Belize, Dominica, Saint kitts and nevis, Saint lucia, Turks and caicos islands, Barbados, Bermuda, Bolivia, Guadeloupe, Cayman islands, Sri lanka, Luxembourg, Maldives, Oman.